«First drawn to the place by its unusual buildings and riverside landscapes, José Bandeira has been photographing the old Dafundo neighborhood, in the outskirts of Lisbon, in the course of the last year and a half. There he met Euclides, an immigrant from Cape Verde who runs a modest tavern on the Clemente Vicente building, and through him many of its residents. The austere construction was built a century ago to accommodate the working men of two factories in the vicinity; now it provides lodging for a differentiated community which includes a significant number of immigrants and retired elders. Euclides’ “Café Africano” serves as a meeting spot for these and other inhabitants of old Dafundo, some of them living on the verge of destitution. Perhaps because José never forgets to give the locals prints of the portraits he takes, they learned to trust him and his camera. 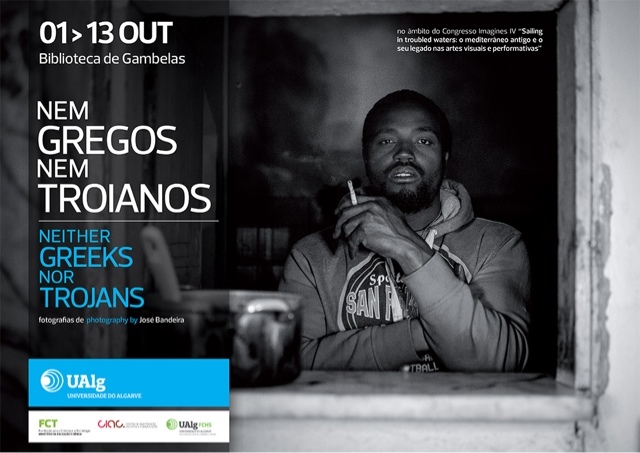 He unambiguously assume that his pictures of the Dafundo inhabitants are a compromise between his photographic vision and the idea his models have of what a portrait should be. Seen as a whole, the hundreds of photographs José took in the neighborhood are as much an artistic pursuit as they are documents of a soon-to-disappear world. At some time José, who has an interest in the Classics, saw what he himself calls an "unlikely connection" between the Clemente Vicente building, with its severe façade, and the Troy citadel. The simile was strengthened by the fact that the locals kept small boats, tents and furniture, vegetable gardens, bird cages, and all sorts of peculiar objects in a land strip adjacent to the Lisbon-Cascais railway line, which, in its turn, runs parallel to the (once chic but now highly degraded) Dafundo beach. José turned the land strip into a Mycenic camp and the railway line into a defensive wall and ditch ("What's a suburban train but a moving wall?," he asks.) To complete the picture, the hazardous Ivens Avenue, a straight, busy road with no pedestrian crossings, became a stretched-out Trojan plane. After a geography was defined, José started toying with the idea of posing some of the inhabitants as characters of the Iliad and the Epic Cycle. This implied narrating to each one of them the complete story, from the Judgment of Paris to the returns of the Greek heroes, with an emphasis on the specific character they were to embody. How would people who never heard of the Classics (but whose life experience — including, in some cases, fighting a war — gave particular authority) respond to the narrative and the moral issues it poses? Were there points of contact between the sense of vulnerability – sometimes even hopelessness – of their lives and that of the Greek and Trojan contenders after ten years of ruthless war? When Professor Adriana Freire Nogueira, of the University of the Algarve, suggested that "Neither Greeks nor Trojans" could be integrated in the Imagines IV Congress and hosted at the University, what was little more than an idea became a de facto project. José spent the months of July and August 2014 shooting "Cycle" photographs; a selection of 24 – incidentally, the number of books in the Iliad – now constitute this exhibition.